Posted By:Unknown | At:8:41 AM Be the first to comment! 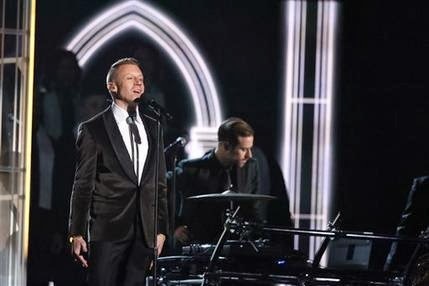 LOS ANGELES (AP) — Everyone felt sorry for Kendrick Lamar after the dazzling young rapper was shut out at the Grammy Awards – even Macklemore, the guy who beat him head-to-head in several categories. Macklemore sent Lamar an apologetic text after winning in the best rap album category, one of two discussion-worthy moments the Seattle rapper engineered Sunday night. That was one of four awards for best new artist Macklemore & Ryan Lewis, and the one that sparked the most grumbling. Macklemore, whose real name is Ben Haggerty, has made no secret of his opinion in the best rap album category, declaring early on that he felt Lamar’s “good kid, m.A.A.d. city” should win best rap album over his own record “The Heist.” Drake, Jay Z and Kanye West also were nominated in the category, but the hip-hop community seemed to throw its hopes behind Lamar, a 26-year-old Compton native and Dr. Dre protege who has deep respect from his peers because of his raw talent, verbal abilities and cinematic vision. Haggerty’s publicist said the Seattle rapper was unavailable to discuss his text Monday morning, but he had explained his feelings in an interview with The Associated Press last week. The performance/wedding included Queen Latifah officiating for 33 couples and an appearance by Madonna, and played out in front of 28.5 million viewers, the second largest television audience since 1993, according to preliminary Nielsen Company ratings. It brought tears to the eyes of not only participants but also stars like Keith Urban and Katy Perry, who were on their feet for the emotional moment. The moment was potentially divisive in a nation wrestling with social issues, something The Recording Academy’s president, Neil Portnow, acknowledged afterward. But he said it wasn’t a political stand for the academy. It was a chance to help artists portray their music in the way they want. This by far was the BEST performance of the night!!!! !